What's that you say? I'm supposed to be telling you what's for supper? Ehh. I figured it's your turn. We've been a little...preoccupied...over here, and the meal planning brain cells are being used for other things. Like keeping heads above water. In mid-October, Bubby was running through the woods, tripped, and fell, impaling his cheek on a stick. A trip to the ER and 4 stitches later, we thought we were done. We'd keep the laceration clean, it would heal, and we'd move on with our lives. Nope. Over the next 2 days, Bubby's cheek proceeded to swell to well over double its normal size. Monday morning we were at the clinic, where the doctor told us he thought there was a foreign body (aka part of the stick) in Bubby's cheek. He told me that he thought it was probably just a little sliver, and would work its way out the same way it went in. He instructed us to call if the swelling hadn't gone down in 48 hours. 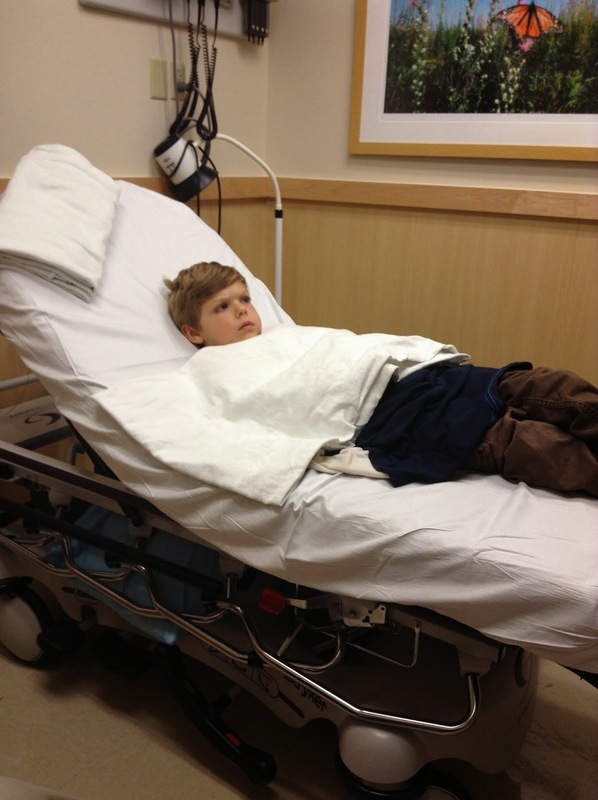 You guessed it--48 hours later, no change, so the doctor sent us to the ER at the Children's hospital. The ER doc and his plastic surgeon sidekick didn't seem to think it mattered whether or not there was something stuck in our baby's cheek. Instead, they were concerned that it was infected. They offered to cut it open and clean it out, but recommended that we start with the least invasive treatment. We went home with foul tasting antibiotics and instructions to call if either it got worse or there was no change. It got better. The swelling went down, and Bubby's cheek started looking normal again. Until a few weeks later, when we noticed the cut was sinking, forming a dent in Bubby's face. And then another week later, when localized swelling started just right over the original injury. And there started to be a lot of drainage. Last week we went back to the plastic surgeon who said (as we had been saying for weeks) that it shouldn't be taking this long to heal. Apparently, it was infected again, and the infection was feasting on the fat in Bubby's cheek! On Friday, the plastic surgeon cut open our baby's cheek and cleaned it out. Out of our baby's cheek came a piece of wood about the size of a dime. A dime! The surgeon said it was right on the surface, too. Came right out. How could everyone have missed that in 4 previous visits to health care professionals? Anyway, now we're back to taking foul tasting antibiotics, and hoping that this time, we really are done. Bubby was a rock star, and he's doing great. My friends, I just don't have it in me to be planning meals right now. So. Tonight we'll have leftovers/fend for yourself. I think we'll probably have turkey on Thursday, but the rest of the week is up in the air. Any suggestions? What is it about pizza that makes it a less healthy food? Well, first of all, pizza toppings tend to be high in fat and sodium. Now I'm not saying that those are bad things--we do need both in our diets--but pizza toppings tend to be some of the worst culprits, giving us way more fat and sodium than we need. Then there's the crust--it's full of simple carbs that jack up your blood sugar and leave you craving more carbs a few hours later. Not much I can do about the toppings, except to tell you to make better choices (more veggies, less processed meat). But what if I told you I found a recipe for a gluten-free, carb-free pizza crust that actually tastes just like (or maybe ever better than) the simple-carb version we all know and love? Oh yes, I did! I know you don't believe me. Just trust me on this, and try it before passing judgement, m'kay? You make your crust out of chicken. That's it! Chicken! I know! Crazy, but it works! Chicken crust pizza topped with cheese, mushrooms, red peppers, pepperoni, and chopped tomatoes. Pound a 4-6 oz chicken breast as flat as you can--1/4" thick is good. Brush the chicken breast with olive oil and season (salt and pepper is good; crushed garlic is even better--but use your imagination. Any pizza herbs or spices will be divine). Bake at 375 for about 15 minutes or until cooked through. Next, add your toppings. Pizza sauce, tons of veggies, turkey pepperoni or sausage, and of course, a little bit of cheese. 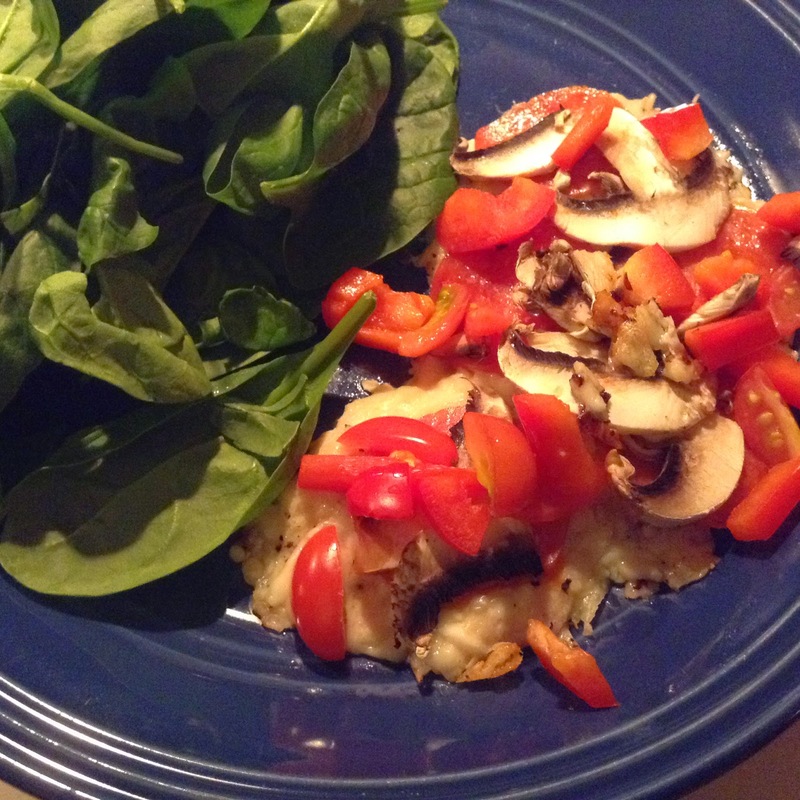 I've been using real grated Parmesan and 2% mozzarella--so yummy! Put your pizza back into the oven for a few minutes until the cheese melts. That's it! I have heard, that if you want to make one large pizza for several people to share, you can just pound your chicken breasts out into a cookie sheet or pizza pan, making sure they're touching, and they will link together during cooking, forming a larger crust. Then just add whatever toppings you wish. Honestly, try it. I'm pretty sure you'll like it. Y'all! When I said on Monday that it doesn't really matter to me what the date is, I didn't realize (well, of course I didn't), that it was November 17th! November 17th! Do you know what this means? Of course! 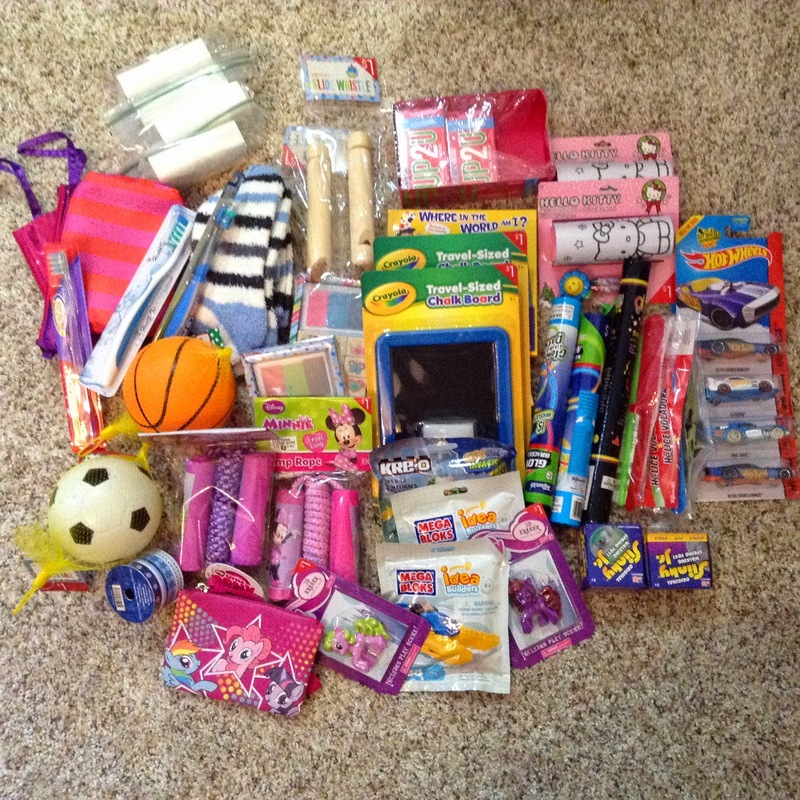 This is national Operation Christmas Child shoebox collection week! Ack! I can't believe I almost missed it! Of course, I'm planning on bringing my boxes with me to the processing center when I volunteer there next month, but you all might not be able to do that. You might have to actually get your boxes to a collection center this week. There is still time, my friends. Make a box. Or two. Or ten. Or a hundred. OK, there might not be enough time to make 100. But you can definitely do one or two. Click here for my tips on packing a box. 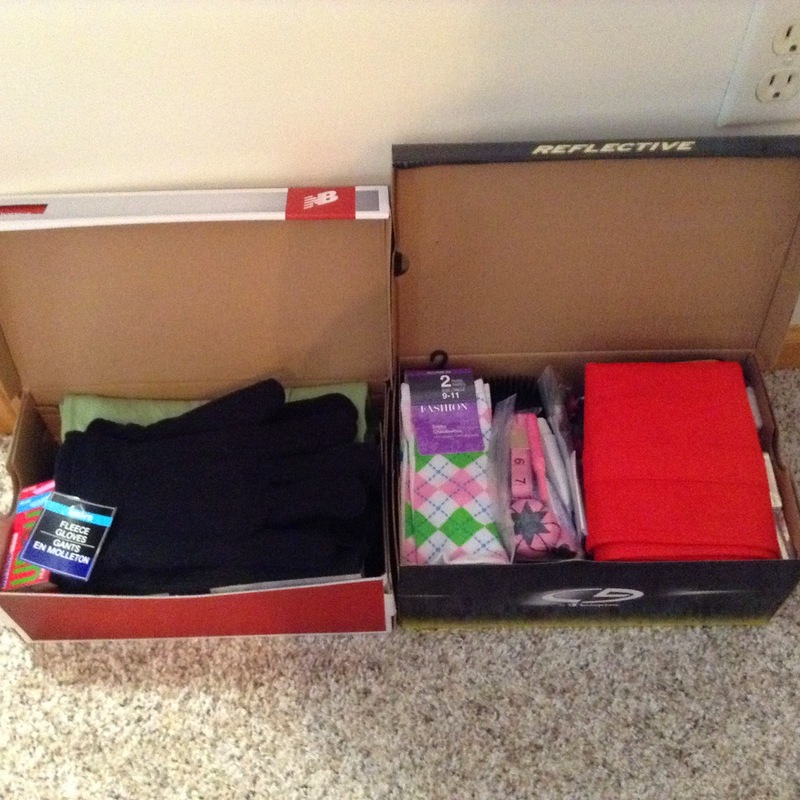 Click here for OCC shoebox guidelines. Click here to find a collection site near you. As for me, like I said last year, this year I packed just 2 boxes, and then bought a bunch of filler items to take with me to the processing center. Sorry I didn't get a better picture of the boxes and/or everything laid out. I just didn't have the heart to unpack everything to show you, because believe me, these boxes are packed! Not sure if I could get it all back in again. a sewing kit consisting of needles, thread, scissors, etc. Your turn: did you pack boxes this year? What's in your box? It's not exactly road trip season, but a lot of people do hit the road at this time of year, visiting family for holidays, so I thought I'd share another secret weapon in our road trip arsenal, to be used only in case of emergency: bubble gum. Yup, that's right, bubble gum. Let me set the scene for ya. It's August. Our family has just spent about 45 hours traveling vast distances together in our Suburban in the past week, when we hit what is perhaps the worst rush hour traffic we have ever seen. We are sitting still more than we're moving, and when we are moving, we are inching painfully forward, less than a car length at a time. Someone has to go to the bathroom, more than one someone is hungry, and pretty much everyone is ready to crawl out of their skin. It's an hour and a half in to what is usually about a half hour journey through the city, and we are less than halfway through. Did I mention I was driving and Hubby was on a conference call for work? Yeah. So much fun. That's when I deployed the Hubba Bubba for...what else? A bubble blowing contest. Bubby was just 4 at the time, and could barely fit his piece in his cute little mouth to even chew it. MC couldn't figure out the technique and kept spitting it out when he tried to blow. AKD was competent, but I have to say I won, hands down. It was hilarious, as in my tummy hurt from laughing so hard. While our contest was going on, we had to be quiet for Daddy's phone call, which just made everything funnier. The bubble blowing contest provided just enough silly to snap us all out of our traffic-and-travel-induced funk. And the best part? Our bubble blowing contest kept us fully occupied for a good half hour. A miracle, to be sure. Hubba bubba, I humbly thank you. Menu plan for the week of...whatever today is. That's right. I have no idea what the date is (other than that it's November teen-something), and can't be bothered to look right now. Any of y'all have this problem? It's been...oh...about 15 years since I've known what the date is. And honestly? That's OK with me. Know what's not OK with me? My husband eating my candy corn. True, I don't like candy corn, so he probably thought I wouldn't want any, but ugh! I told him not to eat it! He should know me well enough by now to know that any candy corn he finds after Hallowe'en is mine, all mine. As I write this (Sunday night), we are staring down our first measureable snowfall of the season. They're calling for several inches beginning right around rush hour tomorrow morning. I say, bring it on. If it's going to be cold, there might as well be snow on the ground so we can enjoy it. I just hope I am able to get around, 'cause I got places to go, people to see. This colder weather makes me crave warm, hearty, delicious comfort food. Mmm. --In the words of AKD, "that stuff with the soy sauce." Neither of us can remember what it's called, but it involves lean ground beef and diced potatoes, and we serve it with soy sauce. So yummy! This is so much more than a recipe, my friends. 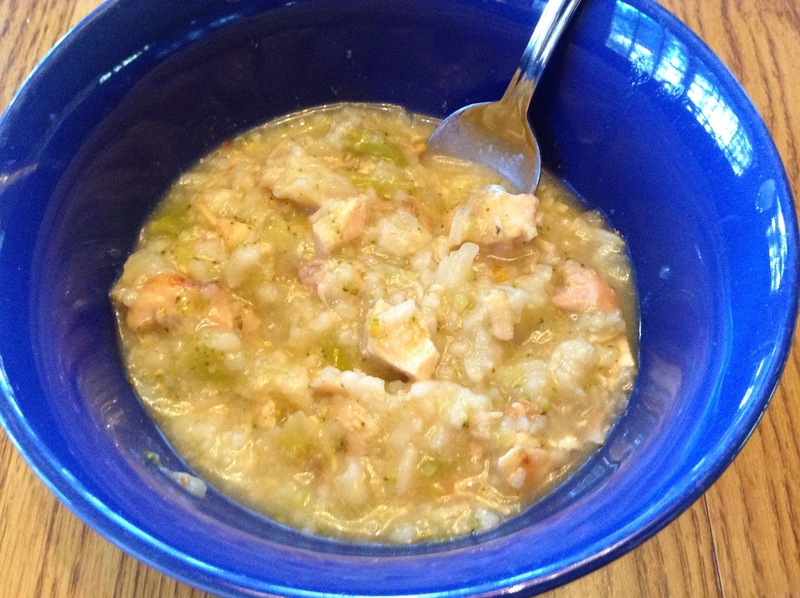 This is family history and fond memories all rolled up into a hearty, satisfying bowl. This is us, sitting at a table in a cramped kitchen with Hubby's grandpa years ago, recording a decades-old, but never written-down recipe. Whenever I make this soup, I can picture Grandpa R sitting at the table, gesturing emphatically, sharing the secret to his chicken rice soup. It's all about the rice. A few weeks ago, I shared on Facebook that I was making this soup, and a cousin of my husband's mentioned that she'd like to have the recipe. As I told her, I can give you the recipe, but no way can I replicate the explanation that went along with it--that exists only in my memory. This soup is thick and meaty, delicious, and the very definition of comfort food. I hope you like it as much as we do. First, you need 3 good-sized chicken breasts. Grandpa was talking about whole, bone-in, skin-on, chicken breasts. As in, I would call this 6 breasts, but back in the day, that's how they bought them, still connected to each other. Put them in a big pot, and cover them with water. Bring it to a boil and simmer, covered, for 40 minutes. When the 40 minutes have passed, remove the chicken from the pot, and set aside to cool until it can be handled. SAVE the broth! When the chicken has cooled, remove the skin and bones, and shred the chicken. Measure how much cooking liquid, or broth, you have, and add canned chicken broth to equal 12 cups. One can of broth equals 2 cups of liquid. Put the chicken back in the pot with the 12 cups of chicken broth and add 1 c. of finely diced celery and 3/4 c. Uncle Ben's Converted rice. It must be converted, or the soup won't taste nearly as good. Can't be having heathen rice in our soup. Bring the soup to a boil, and simmer for 20-30 minutes. That's it. I think Grandpa R was a little taken aback that Hubby had even asked for the recipe, it's so simple to make. The house smells heavenly and the memories are sweet when I serve this soup. As you can probably tell from the recipe, this makes a lot--this soup freezes extremely well, and I think it tastes even better the next day. In the interests of full disclosure, I should tell you that sometimes, to bump up the nutrition, and make this a one-pot meal, I add a 1 lb package of frozen broccoli, cauliflower, and carrots during the last 10 minutes or so. I have also been known to add 1/2 a cup of raw, chopped spinach to my bowl before ladling in the soup--either way it's delicious, and a tribute to Hubby's much-loved grandparents. I recently read The Underground Girls of Kabul: In Search of a Hidden Resistance in Afghanistan by Jenny Nordberg. In Afghanistan, girls and women are worth nothing aside from their ability to produce sons for a family. The birth of a boy is cause for celebration; the birth of a girl, cause for shame and ridicule. In a culture where honor is everything, and appearances must be kept up, what's a girl to do? What is a family to do when they've produced no sons? They create one. While on assignment in Afghanistan, reporter Jenny Nordberg uncovered, quite by accident, the practice of bacha posh. Literally translated as "dressed up like a boy," a bacha posh is a girl, temporarily raised as a boy and presented to the world as such. This book brings us along on her journey to dig more into the practice of bacha posh. Along the way, we are swept up in the lives of Ms. Nordberg's vivid characters, learning more about the hows and whys of bacha posh, and the effect on the girls, their families, and their society. I found this book to be just fascinating. I found it hard to put down, and that's rare for me, when reading nonfiction. I needed to keep reading to find out what became of the families that Ms. Nordberg met along the way. The author's story-telling is exceptional and her themes reach beyond Afghanistan, examining our own history and the parallels to subversive actions of people who are oppressed everywhere. Bottom line: This book was fascinating and made me think. Highly recommend. November 3! What?!? How can it be November already? Yowza.